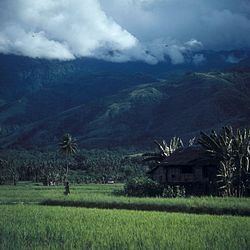 Established in 1964, Central Sulawesi has an area of 61,841.29 km2 (23,877 sq mi). It is bordered by the provinces of Gorontalo to the north, West Sulawesi, South Sulawesi and South East Sulawesi to the south, by Maluku to the east, and by the Makassar Strait to the west. 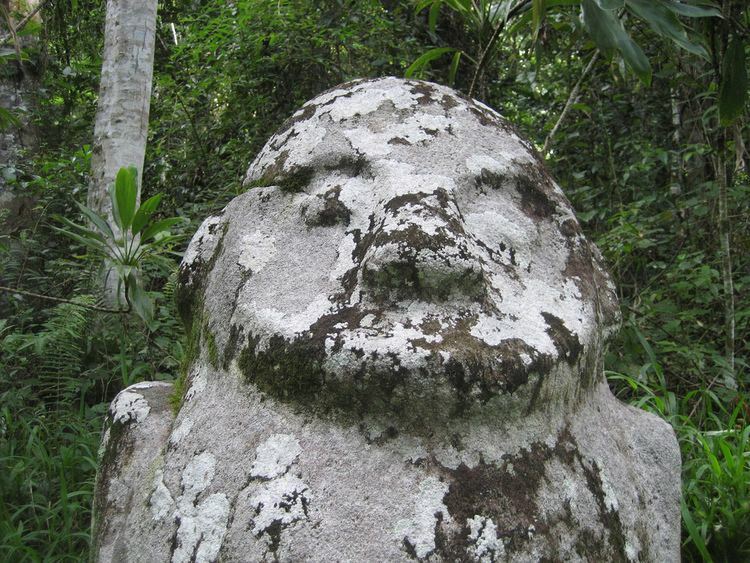 There are over 400 granite megaliths in the area of the Lore Lindu National Park, of which around 30 represent human forms. They vary in size from a few centimetres to approximately 4.5 metres (15 ft). The original purpose of the megaliths is unknown. Other megaliths in the area are large stone pots (Kalamba) accompanied by stone lids (Tutu'na). Various archaeological studies have dated the carvings from between 3000 BC to 1300 AD. Central Sulawesi Province has many caves, seven of which have ancient pictures and, based on 2011 research by a joint Indonesian and Australian team, the pictures are known to have been drawn at least 40,000 years ago (about the same age as pictures found in the Caves of Monte Castillo, Spain which are known as the oldest ancient pictures in Europe). Islam reached the region in the 17th century, shortly after the Islamic avowal of Gowa, the powerful kingdom at the south part of the Sulawesi island. The Dutch colonial rule was established in the 18th century and began the protestantic missionary of the population. About a quarter of them are now Protestant, which is the highest percentage of the Indonesien archipelago. After the Japanese occupation in the Second World War, the region belonged to the Province North Sulawesi and separated in 1964 to the new formed Province Central Sulawesi. Between 1999 and 2001 the region has been plagued by inter-religious violence between Muslims and Christians, where over 1,000 people were killed. The Malino II Accord was thus made in 2001. However, riots erupted again in September 2006 on the Christian dominated areas of Central Sulawesi, after the execution by firing squad of three Roman Catholics convicted of leading Christian militants during the violence of the early first decade of the 21st century. The riots appeared to be aimed at government authorities, not Muslims. Central Sulawesi is divided into twelve regencies (kabupaten) and one city (kota), which are listed below with their populations at the 2010 Census and according to the latest (for January 2014) estimates. * The 2000 Census populations for Parigi Moutong Regency and Sigi Regency are included in the figure for Donggala Regency. # The 2000 Census population for Tojo Una-Una Regency is included in the figure for Poso Regency. Palu is the provincial capital and the province's largest city. Other towns include Ampana, Banggai, Bungku, Buol, Donggala, Kolonodale, Luwuk, Parigi, Poso, and Toli-toli. The decennial 2010 census recorded a population of 2,633,420 for the province, of which 1,349,225 are male and 1,284,195 are female. The population grew an average of 1.94% annually from the previous census. There is some sort of religion interaction problems in this area Most of the population are Muslims (76,6%). Average annual population growth between 1990 and 2000 was 2.57% and 1.96% from 2000 to 2010. Morowali Regency, Central Sulawesi, is projected to be the biggest seaweed producer in Indonesia for the near future. The seaweed farming types are glaciria. In 2010, Central Sulawesi produced nearly 800,000 tons of seaweed.